Nothing creates a stronger impression in someone’s mind than being remembered. What if there was an easy, affordable way to follow up with customers and new leads with offers and keep in touch with clients, family and friends one at a time or hundreds at a time… Full color, REAL cards and postcards that go through the mail, (not email) for that personal touch at a great savings. Send a Free Card — see for yourself how easy and fun it is. Don’t like to waste resources… save gas, time and stop buying cards that don’t ever get sent. Make the most of a new opportunity, send a card right after meeting a new customer or send several after a networking event .Always have the right card for the right person and the right occasion at your fingertips. Automate your Keep-in-Touch strategy… with a system that is as easy to use as sending an email. Save money and printing costs… send a handwritten card with your picture or logo for less than $1.00. Create a special, personalized message… so that your customers, referral partners and friends can know that you really care. Generate passive revenue and affiliate commissions… just by sending cards and mentioning this great system to other professionals. Never miss a birthday or special event… now that you have a contact manager that reminds you when and where to send the card. Build trust and credibility with your community… by saying thank you and expressing your appreciation easily and effortlessly. Make everybody you follow up with feel special with a real card! Best Impression Cards is perfect for networking too. The best way to keep your name front and center in your customer’s mind is to remember them. Best Impression Cards from SendOutCards is quick and easy, and looks like you spent tons on each customer contact—perfect for strategic partners and referral sources, friends and family too. Bottom line? If you want to make the best impression you can, each and every time, you need an effective offline keep-in-touch strategy as well. There are 1000’s of cards to choose from and for just a few pennies more you can create one with your logo, picture, illustration…. You have the option of using your own handwriting so it is signed by you— type your personal note and watch the computer magically turn your keystrokes into your own handwriting. Choose from over 15,000 cards or create your own personalized card with your picture or logo. Hand-stamped and sent out from your own automated contact manager in just a couple of minutes, from your computer. Shazaam! Just click send—the system does the rest for you. The result? A beautiful, personalized, hand-stamped card arrives in their USPS mailbox. And BEST OF ALL shock your family and friends when you remember their special occasions on-time too! Discover why this may be the most important marketing decision you make this year. If you are retailer, send a "nice to meet you" card after their first purchase, or create postcards for each month with a discount coupon based on upcoming holidays. If you are in insurance, have a quick way to follow-up with your clients after a storm. If you are a realtor, create a card campaign to show your latest listing or send immediate congratulatory cards after closing, and again 90 days later making sure they are settling into the new neighborhood, or a holiday card, followed by a card asking for a referral. Find out how you can start using Send Out Cards right now to build trust, credibility and a loyal following. You can give it a test drive by investing in the Retail Membership for $99. Or, if you already know you’ll be sending a higher volume of cards (for birthdays, holidays, thank you, etc. ), you’ll want to invest in the Wholesale Membership for $298. Sign up today and you will be on your way to building great relationships, turning customers into raving fans and letting family know you care. All this is possible, now that you will have a automatic, affordable, consistent system for keeping in touch. Have a great day in whatever your adventure. p,s, if you haven’t yet done it Send a card right now—Free—that’s right, on us! 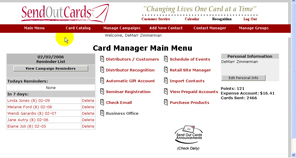 See for yourself how powerful this Keep-In-Touch Strategy using Send Out Cards can be for your business.